We've had a lot of requests for this one and we're happy to announce that it's now live and ready for use. 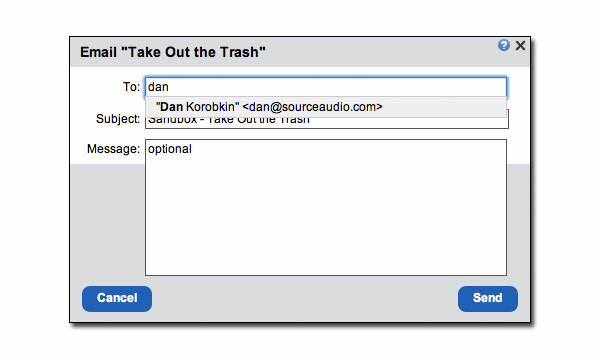 No longer do you have to type in complete email addresses each time you send a client a project, track, or album from your site. We've implemented new "find-as-you-type" functionality that intelligently auto-completes the names or email addresses you type into the email sending overlay. This works in two easy ways: 1) you get quick access to emails you've already sent projects to in the past, and 2) email addresses that correspond to user accounts on your site can be quickly pulled up as well. So, no more copy/paste sessions when you want to send out an email! Just type in the first few letters of the user's name or email and let your site do the rest.